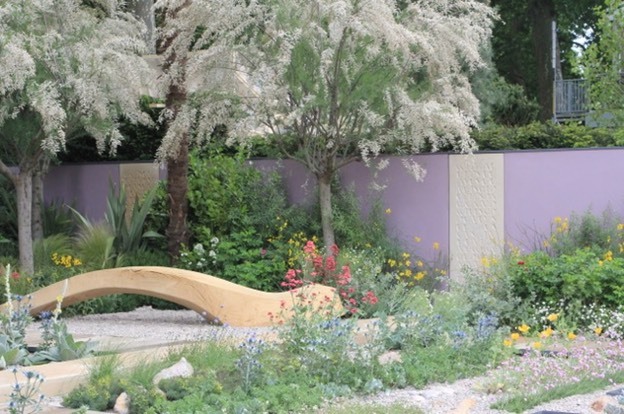 In 2011 Robert Myers, the landscape architect and designer of the cancer Research Garden UK garden, commissioned me to design and carve 3 lettered panels for the back wall on the theme of ‘surviving – a celebration of life. On the list of perfect commissions this one scored a ten. 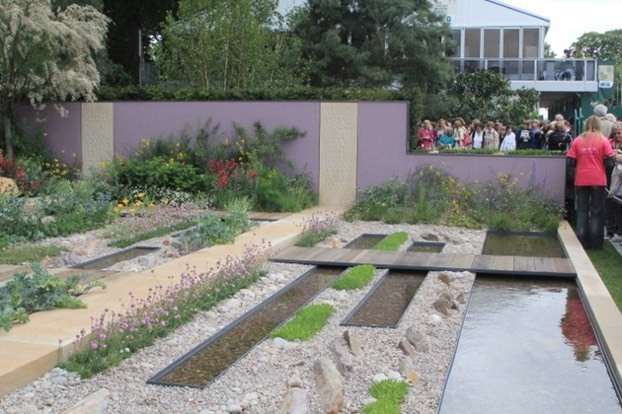 Having been told the material: Spanish sandstone, the size of the stones: 1750,1650 and 1550 by 600mm, and the overall design concept of the garden, I was asked to suggest the words and come up with some designs. is rid of its dark and will suddenly see the sunshine on its new-bared bark and is at long last blissfully blinded and fully reminded of its past. What appears in such light as near the end turns out as a mere branch or a bend a beginning. The chosen design was much influenced by a card hanging on my wall of pen lettering by Lieve Cornil, and I am very grateful to her for allowing me to use her shapes as inspiration. 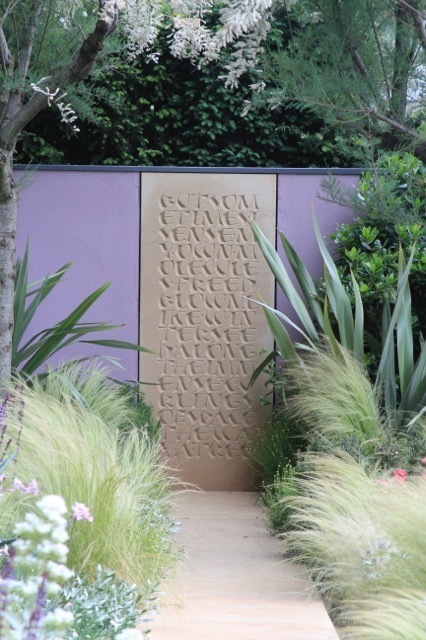 The first draft of the lettering showed the text from right to left, the direction of entering the garden. After much soul searching both Robert and I thought this was not really sensible as we naturally read from left to right. We also decided that each stone had to start and finish on a word rather than any old letter. This made for a complete redesign. I scanned the alphabet into the computer and then laid each stone out in photoshop, a layer per letter so I could move them around singly. It worked, but slowly. I then printed the design at full size and redrew it all onto typo detail paper. 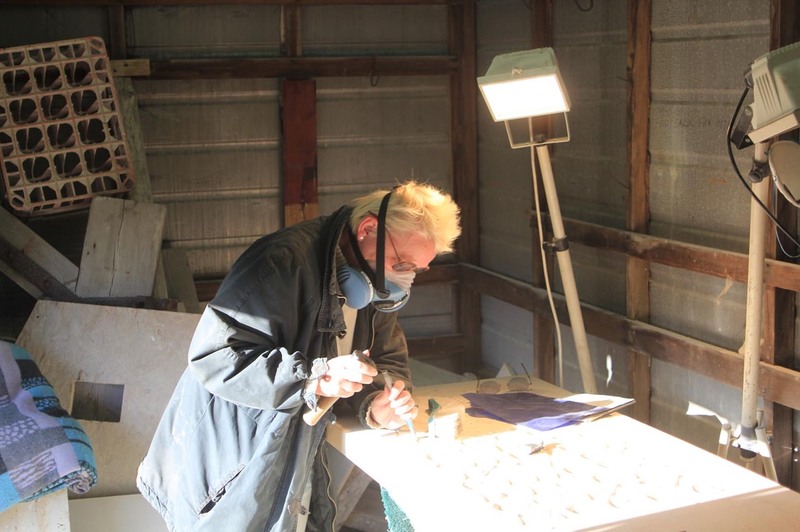 The stones were delivered to St. Aldhelm’s quarry in Purbeck where I spent a lovely 3 weeks carving - fully masked!